Hello Thomas, we are so blessed to have Garron as a part of our family. Thank you so much for helping us chose the best dog ever. Here he is at almost 11 weeks. Hi Thomas, thought I would share a recent picture of Bear – he is beautiful. As you would know he is also a handful…. We are attending training classes locally and making good progress. It’s been almost a year since we picked up little Nero, not sure if you remember us, but wanted to drop you a line and give you an update. What a year it’s been! Nero is such an awesome dog! We ended up discovering PSA and decided to get Nero started in that vs. Schutzhund (for right now). We are there every Sunday in Santa Rosa…if you are ever down this way, you should come check out our club…it’s a great group of people. Both Ray and I are very involved in the sport and learning to decoy. Nero will be going for at least his PDC in January at the trail that will be held in Lake County. Come on down and check it out :)! Again, I wanted to thank you for all that you do. I can’t imagine what life would be without my little dude, Nero (who isn’t so little anymore at 80lbs). I only hope that one day we’ll live in a home outside of the City so that we can purchase another of your puppies :). Getting Nero has also been one of the best things we could have done for our fearful GSD, Luna. We’ve worked with her quite extensively on obedience…while she’ll always be a fearful dog, her confidence has greatly improved. I know that having another solid dog has really helped that. I’ve attached a couple of recent pics…all taken around his first birthday on July 21st. One is a car jacking scenario during a PSA Workshop weekend. The other is Nero working obedience during bite work…with a party hat on, of course. And the other is just him at the trail by our house in SF. 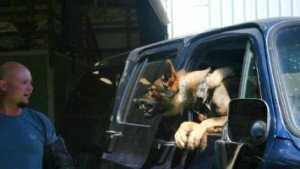 Even though we are involved with PSA right now, we are still interested in getting Luna a BH and getting Nero titled in Schutzhund eventually as well. I’d love to hear if you have any trials at your facility in the future. Knight is a wonderful dog with a great temperament. Our family loves him dearly. Knight and I have done extensive training and work on his skills everyday. He loves running the trails and time with his boys. Thank you so much Thomas! I wanted to thank you again for everything…we LOVE little Nero. He’s fiery and sassy and is keeping everybody on their toes, especially his big sister, Luna. We love it :). Really is the sweetest puppy. He’s already sitz-ing and learning to platz and walk on leash (though does put on the breaks from time to time). He made the switch to a raw diet and loves it…tries to eat the bowl and all :). I’ve attached a few recent pics…he’s grown so much already. We are taking him to the vet today for his second round of shots and worming. Really looking forward to getting him started in Schutzhund. We can see such play/pray drive already (poor cats!) and his bite is pretty fierce…he pulls bully sticks and toys away from Luna :). We’ll let you know when we will be back up for class. Hope all is well. I just wanted to share a picture or two of Shadow on his 1 year birthday today so you can see how great he is turning out to be. He is truly an amazing dog and such a pleasure to have in our family. His is super smart…sometimes stubborn:)…but equally affectionate and playful…and always ready to be trained and learn. Here are a few pictures of him in Santa Cruz today. Take care and hope to show you how well he’s doing in person some time this Summer. Just came across your web site and wanted to take a minute and tell you how much we have enjoyed Aloa over the last 6 years. She is such a beautiful animal and she is an incredible addition to our family. Thank you again for doing what you do and preparing these dogs to be such great additions to families. Hope you have great Holiday. Maybe we can bring her up sometime so you can see her again. I just wanted to let you know how happy I am with her. She is a very smart and beautiful dog. 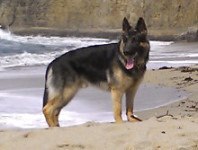 I have taken her to one private training session with a woman in my area that has worked with GSD’s for 40 years. I look forward to Isis developing into a true friend and working partner with me. I will keep you updated on how she is doing…. I hope you had a wonderful Thanksgiving. Sam is a great dog and has already brought us a lot of joy. He is getting along very well with Cinder and Thomas (the cat). We took him to a park on Saturday and Sunday to let him interact with other people and dogs–he was wonderful. Thought you might be interested to know Romy went to a 3-day training course in Texas. Romy was the best, evidently, and got great comments on temperament. She is even off-leash walking these days!!! Not yet 6 months old! We love Baxter so much. He and Bella get along very well. We couldn’t be happier with the two puppies we got from you. They are gifts from God. It has been our distinct pleasure to deal with you on our Female puppy we named “Sophie.” She is everything we wanted in a pure-bred German Shepard from imported German Bloodlines. 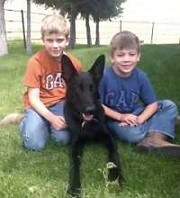 We lost our last German Shepherd (Hanna) because of hip problems and did not want the same problems again. We also wanted a “True” German Shepherd based on the exacting standards required for breeding in Germany. She has great temperament and is already guarding our house. She barks at any unknown dogs or humans. She is well on her way to being housebroken thanks to your training. She is also very loving and gentle with all of our family. We look forward to many years of joy and pleasure with Sophie. Again, you are a true professional and we have enjoyed the experience. Heidi was perfect on her 6 hour drive home. You must have worked a lot with those puppies, because Heidi listens so well, potties outside and is the sweetest doll in the world. We cant imagine our home without her now. Thank you again for our bundle of joy. She couldn’t be more perfect. Thank you for such a wonderful dog. She gets along with our female Sabrina who is almost 12 years old. I spoke to Mike White and we definitely want the all black male that was shown on-line. Please send up to date photos as soon as you can. This is Mark P. in Santa Maria, we purchased Jasper vom Heidelberger-Schloss from you he is the brother of Jolly vom Heidelberger-Schloss. How is everything going? I have attached a couple of photos of Jasper. He is about 22 months old now and has amazing temperament and is very smart. As you can see we have a baby on the way, my wife is due in two weeks. Jasper loves his ball. Is Jolly for sale she looks just like Jasper. I¹ll talk to you later. The other photo I took with Jasper running straight at me. He was running for his ball. Roxy is a great puppy! Not only is she extremely cute, but she is showing a lot of drive. She already plays tugging games with a rope and will chase a ball. She has no fear of the other dogs in the house and is right in the middle of everything that I try and do. The puppy is coming along fine. He catches on real fast. He is already housebroken after 7 days. From the beginning he went outside right away. I will keep you updated on his progress. I just wanted to send you a note and let you know how great things are going with the puppy I picked up a few days ago. I have had German Shepherds for over thirty years and this is the best I have ever had. He is so smart and he catches on super fast. Thanks so much. I will keep you informed as to how his training goes. Just wanted to thank you so much for my puppy Emil (Claymore). This dog is SMART and never afraid of anything! Although he is only almost 10 months old, I have never seen him show submissiveness or fear…even in the presence of much larger dogs or when there were a lot of people around. At the same time, he does not display any aggressive traits when greeting other dogs or people. He’s been all over the country the past month and has had ample socialization. What a great pup! He was fetching from the very first day and learned to sit on command within just a few days. He’s also a pleasure to walk on the leash. The seven months we waited for this puppy were worth every minute. We have started working with him on tracking and he does an excellent job of it. He makes all the corners and stays right on the track…even in tall grass where he cannot see where the track was laid! Only four months old and he makes every other dog I have owned seem to have an intelligence deficit. Can’t wait to see how he does as he matures. I’ve already decided that should I decide to get a female for breeding later, I’ll let you pick her. This dog is exactly what we were looking for! Thank you! Thank you! Thank you! P.S. We will be sending Emil to you for his BH when he is old enough. Thanks!